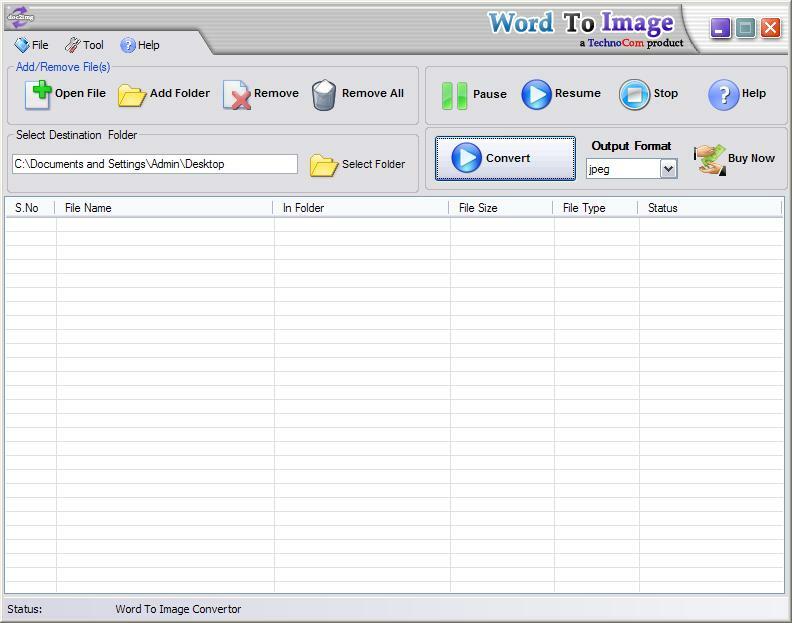 Word to Image Converter is a professional and powerful Word document to Image converter (JPEG, JPG, TIFF, GIF, TIF, PNG, EXIF, BMP, EMF ). Word To Image Converter can convert your doc, docm, rtf, docx files to any type of images like jpg, jpeg, tif, gif, bmp, emf, png,exif in batches (Batch processing mode). The output image quality is very high and preserving the original text, tables, image, layout of your Word document. It works very fast . ...... more faster. User-friendly interface is very easy to use without any technical requirements. * Converts doc file to Image of all formats (jpg, jpeg, tiff, gif, tif, png, exif, bmp, emf)..
* Convert all MS Word file (DOC, DOCX, RTF, DOCM, DOT)to Image. * You can choose the entire folder to be converted. * Accurately retains the layout of the original presentation file of Word file in the image in all formats like BMP, JPG, JPEG, TIF, TIFF, EXIF, PNG, EMF, GIF. * Easy to use. Converts with just one click. * 1000's of files can be converted in a single click. Quickly convert DWG to BMP, GIF, JPEG and many other image formats. Qweas is providing links to Word To Image Converter 2.6 as a courtesy, and makes no representations regarding Word To Image Converter or any other applications or any information related thereto. Any questions, complaints or claims regarding this application Word To Image Converter 2.6 must be directed to the appropriate software vendor. You may click the publisher link of Word To Image Converter on the top of this page to get more details about the vendor.